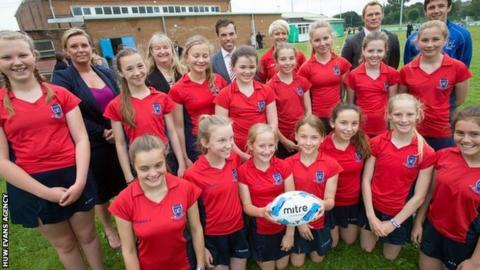 Wales' head of rugby Josh Lewsey has predicted an "explosion" in the number of girls playing in Wales. The 2003 England World Cup winner was speaking as the Welsh Rugby Union (WRU) highlighted figures which show a 676% increase in girls aged up to 15 playing the sport. "The statistics speak for themselves," he said. "They're very flattering; very pleased with the work they've done - clearly shows the model working." He added: "But being very humble about it, we're starting from a very low base." The union's plan to increase the number of girls playing took the number of girls teams from six to 107 in season 2014-15. Girls fixtures rose from 37 to 561 and playing numbers from 170 to 1,320, according to the governing body. There are 43 school-club hubs where touch and sevens versions of the sport have been introduced. The hubs will increase from 43 to 80 in September, 2015 and the season for girls rugby will in future run in the spring and summer terms. An Under-18 league will also be introduced. Speaking at Ysgol Gyfun Glantaf, Cardiff where the initiative was launched, the WRU's head of rugby Lewsey said: "Going to 80 hubs in September - we're looking at an explosion of the game in Wales. "And the challenge for us is making sure that is maintained." Lewsey says the union's future challenge will be to ensure girls can continue playing at community clubs. WRU national women's rugby manager Caroline Spanton said: "We want to create a pathway for girls that fosters participation, retains involvement and develops talent. "The changes aim to cater for players' stage in the game and not their age, so if girls want to continue to play tag rugby rather than contact rugby, we will cater for that."